This is a brand new set of AMP Research Plug-n-Play Power Steps. We are an Authorized Dealer of Amp Research and carry the full line of products. 14-'18 Chevy Silverado 1500 Double Cab/Crew Cab'14-'18 GMC Sierra 1500 Double Cab/Crew Cab'15-'18 Chevy Silverado 2500/3500 Double Cab/Crew Cab (Excludes Diesel Models)'15-'18 GMC Sierra 2500/3500 Double Cab/Crew Cab (Excludes Diesel Models) Part #: 76154-01A. Powerstep w/ Plug-N-Play Automatic Running Boards Invented By AMP Research The Rock-solid, slip-resistant and fully-illuminated, the AMP RESEARCH POWERSTEP automatic retractable truck steps extend when any door is opened. Then retracts when the doors are closed, storing itself elegantly out of sight, without giving up even an inch of ground clearance. Its handsome design, all-weather performance and legendary reliability set the industry standard. Vehicle Weight Reducing the overall weight of your vehicle can also help improve gas mileage. AMPs high-strength aluminum steps weigh 10-20% less than typical OEM running boards or aftermarket steel tube steps. Aerodynamics Under The Vehicle AMPs PowerStep running boards work automatically and improve safety and comfort while entering and exiting your truck. They are activated by your trucks factory door sensors and extend within a few seconds when you open the door. Closing the door automatically retracts the PowerStep into the rocker panels, eliminating the drag produced by traditional stationary running boards. AMPs PowerStep technology has been utilized as a factory option since 2003. Invented, Engineered And Built In America. LED Light Kit System Engineered to integrate with the AMP Research Power Step wiring harness, four (4) low profile LED lights are strategically placed under the rocker panel for broad coverage and reliability in extreme driving conditions. When doors open, the running boards are illuminated. While doors are open the lights stay lit for a full five minutes, allowing plenty of time for entry or exit. When doors close, the lights turn off automatically when the steps retract. 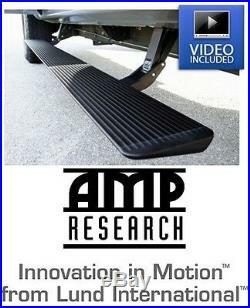 AMP Research Outshines The Imitators AMP Research PowerStep retractable truck steps are the real deal. With an integrated LED lighting system and available stainless-steel trim accent strips, the AMP Research PowerStep is clearly the quality choice. Theres only one PowerStep and it has the AMP Research name on it. Certified aluminum-alloy is used to manufacture our die-cast linkage components and then anodized and Teflon® coatings are applied to a military specification to resist corrosion. Precision-fit, zero-maintenance stainless-steel pivot pins rotate on self-lubricating composite bushings. Components are subjected to and pass a battery of environmental and durability tests including brutal 1000 hour salt spray tests. OEM Quality To meet the quality standards of GM, Ford, Chrysler, Mopar, Toyota and Nissan, AMP Research is ISO 9001 with Design certified. Covered by 16 patents, the AMP Research PowerStep features weatherproof OEM-quality motors, wiring harness and sealed connectors. The AMP-designed electronic controller employs pressure-sensitive, pinch-proof safety technology. Extruded, 6063-aluminum step boards have two internal ribs for added stiffness and rigidity and are given a high-traction powder coat finish maximum grip and durabilityand a 600 Lb load capacity for each side. Each AMP Research PowerStep kit includes two full-length running boards assemblies for both driver and passenger sides, two electric motors, electronic controller, wiring harness, all necessary mounting hardware and an integrated, low-profile, LED light system all standard. To make your shopping experience as simple and easy as possible, please refer to our company policies shown below. Tracking numbers are updated manually, so please allow enough time for your information to be entered after your order has been placed. AZ Offroad & Performance, Inc. & will do everything possible to ensure the customer's satisfaction. Any package without the RA # will be refused. The item "Amp Research Plug-n-Play Power Steps with Light Kit 14-18 Chevy & GMC 1500 Truck" is in sale since Monday, May 8, 2017. This item is in the category "eBay Motors\Parts & Accessories\Car & Truck Parts\Exterior\Nerf Bars & Running Boards". The seller is "azoffroadperformance" and is located in Phoenix, Arizona.